Witnessing Bigfoot: Flesh and Blood, Native American Legend, or the Devil Himself? Glen Boulier spotted Bigfoot two times on the roads outside his hometown of Penticton, BC. These sightings were the start of his quest to discover the true nature of the elusive creature. He spent years researching the stories, the legends, the speculations. He questioned people about their own particular experiences and interviewed researchers, hunters and trackers, forestry workers, and many others. Years of research led him to many stories, from brief encounters to long-term interactions. When Glen learned about tracks that disappeared in the middle of a snowfield and the complete failure of trail cameras to capture an image, he knew then that Bigfoot was more than a rarely seen physical being of the woods. 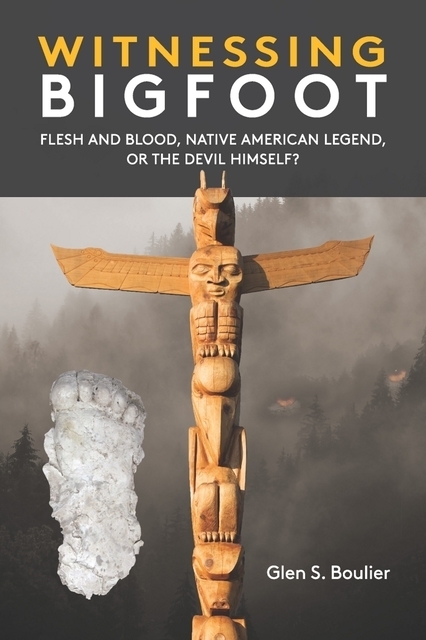 He dug in and went on to speak with Native Americans in the US, the First People in Canada, and others who knew about Bigfoot's connections with the spirit worlds. Witnessing Bigfoot objectively documents what he found. Glen wishes that the Bigfoot he saw was a simple forest creature, but the evidence seems to suggest that it is more. Now you can add Glen's fascinating discoveries to everything else you know about Bigfoot and come to your own conclusions. The quest continues. Glen Boulier was born in Summerside, Prince Edward Island. While his father worked in the Canadian Armed Forces, Glen lived in many parts of Canada and spent two years in Germany. He has enjoyed sports his entire life to include two free-agent tryouts with the Philadelphia Phillies and the Dallas Cowboys. Outdoor adventures include photography, mountain biking, astronomy, and camping where he enjoys renting fire lookouts in the Western United States. He currently lives in Calgary, Alberta, where he is working on two new books in the company of his wife. Whether you are a Bigfoot enthusiast or merely curious, Witnessing Bigfoot should be in your library! Couldn't put it down. From start to finish, Glen Boulier will take you on an intellectual hunt from flesh and blood to spiritual journey and everything in between leaving you in the driver's seat to come to your own conclusions and satisfy the deepest of curiosities and questions. A readable feast that will leave you digesting information for a long time to come. Glen Boulier thoroughly explores every imaginable angle of the Bigfoot phenomenon. Whether one sees the Sasquatch as paranormal entities or just flesh and blood forest creatures, there will be a lot of information and insight to be gained from careful study of Glen's exhaustive research. This book helped galvanize some of my own emerging ideas as to what exactly is going on with these enigmatic beings.